With so much on the line in Sunday’s Chase elimination race at Talladega Superspeedway, the final laps of the CampingWorld.com 500 are sure to be intense. Denny Hamlin enters Sunday’s race second in the standings with a 12-point advantage over Martin Truex Jr. in eighth, the final cutoff spot. 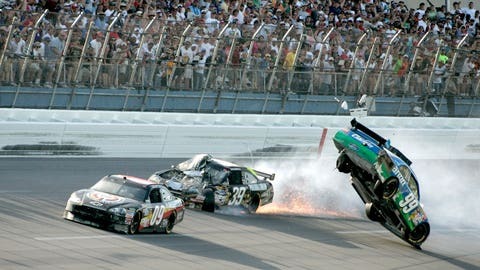 Last season, Kyle Busch entered this race with a 25-point advantage over eighth, but failed to advance to the Eliminator Round after getting collected in a wreck. No one but Joey Logano, who won the first two races of the Contender Round, is safe from elimination on Sunday. With each position potentially making the difference in keeping championship hopes alive and crushing them, how aggressive will the drivers be racing in the pack late in the going? "It’s a balance," said six-time Talladega winner Jeff Gordon. "You have to take each moment and experience to make the most out of it. If you have a car that qualifies up front like we did last time we were here, you want to try and maintain that track position. You have to be a little more aggressive. "There’s a fine line that can get in trouble really easily as well," he said. "But I can tell you that it’s a lot harder when you get shuffled back to work your way toward the front than it used to be. People are smarter, cars are more equal, and the draft and aerodynamics are different than they used to be. It’s hard to make that work if you get behind." For restrictor-plate ace and Gordon’s Hendrick Motorsports teammate Dale Earnhardt Jr., the aggressiveness in the pack depends on how the car is handling and how confident you can be in the car doing what you want it to do. "If you go out there and go through about 50 to 100 laps and the car is just not really showing you what you’re looking for, you lose a little confidence in the ability of the car. And another guy beside you might be going through the opposite situation where his car is awesome and he’s gaining confidence as the race is going on. And with that confidence, his moves and decisions are different and changing," Earnhardt said Friday. "When you don’t believe in the car, you make different decisions," added Earnhardt, who notched his sixth career win at Talladega in the last Sprint Cup race run at the track in May. "You might not go in a direction you would typically go because you don’t believe the car is capable of making that move without causing you to lose spots, right? When you feel like you have a dominant car like we’ve had over the last several years, you definitely make some moves with confidence and you come into the race with confidence. Until we see anything different, we’ll be confident." With potential trouble lurking around the corner from the drop of the green flag until the checkered flag falls, Brad Keselowski said he believes there are likely to be more than a few worried drivers heading into Sunday’s big race. "I think you’re looking at this weekend and there are certainly going to be some people that race scared and racing scared, to me, means sometimes you race not to win, but to not lose as far as the points are concerned," said Keselowski, the defending winner of this fall race. "At Talladega, that is a big effect on the strategy and the way the race plays out. "I think we’ve seen races here, in fact the last spring race, we saw that where the race stayed single-file for a long, long time, which, to me, is kind of somewhat a showing of racing scared, where you’re happy with where you’re running and you don’t want to do anything to jeopardize that so you stay in line," added Keselowski. "The tactics certainly change when the circumstances around them change, and the Chase is certainly a change from a normal race weekend." Last year, Keselowski entered the Talladega race weekend in need of a win to keep his title hopes alive. Throughout the race, and especially in the closing laps, Keselowski made bold moves in the pack to protect and advance his position, eventually working his way to the lead. His aggressiveness paid off, as he celebrated in Victory Lane and kept his championship hopes alive for another three weeks. He is one of 11 drivers in the field looking to do the same thing this year, and it’s sure to be intense.